Welch , Mary Agnes . "Gustafsen Lake Standoff". The Canadian Encyclopedia, 04 February 2019, Historica Canada. https://www.thecanadianencyclopedia.ca/en/article/gustafsen-lake-standoff. Accessed 25 April 2019. The Gustafsen Lake Standoff was a month-long conflict (18 August–17 September 1995) between a small group of First Nations Sun Dancers and the Royal Canadian Mounted Police (RCMP). The standoff took place in central British Columbia, in Secwepemc (Shuswap) territory near 100 Mile House. Sparked by a dispute between a local rancher and a camp of Sun Dancers over access to private land for ceremonial purposes, the armed confrontation raised larger questions of Indigenous land rights in British Columbia. On 11 September 1995, in what was later called the largest paramilitary operation in the history of the province, RCMP surrounded the remote camp and a firefight erupted during which, remarkably, no one was seriously injured. The standoff at Gustafsen Lake is perhaps the least known in a series of localized armed conflicts involving Indigenous peoples in the 1990s that included the Oka and Ipperwash crises in Quebec and Ontario, respectively. 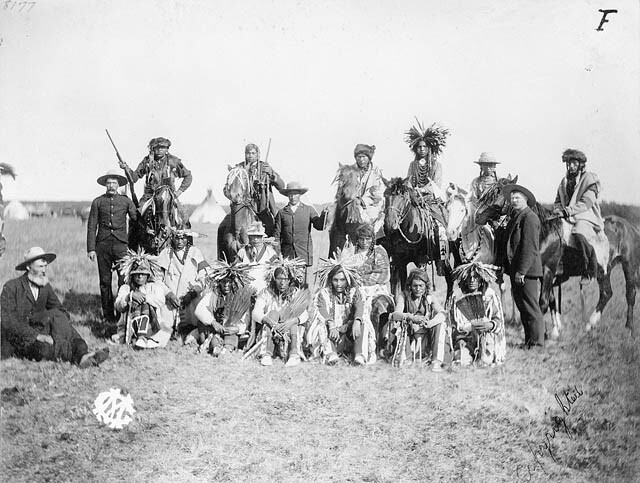 Sun Dance, Cree warriors at Battleford, Saskatchewan (June 1895). The Sun Dance is not traditional to Secwepemec culture, but it has been adopted by many Indigenous peoples as an empowering ceremony. During preparations for the Sun Dance in the summer of 1995, however, this relationship frayed. The Sun Dancers, led by elder Percy Rosette, erected a small structure and a fence to keep James’s cattle out of the sacred site. This angered James and prompted him to deliver an eviction notice in mid-June, demanding the camp of about 20 people leave before the month-long Sun Dance cycle was complete. There were also allegations some of James’s ranch hands harassed the Sun Dancers using racist language, and fired warning shots at the campers. By early September, political rhetoric in the province was on the rise and negotiations to dismantle the camp had proven unsuccessful, including the intervention of Ovide Mercredi, then the national chief of the Assembly of First Nations. The RCMP began putting into place plans to remove the campers by force, bringing in equipment such as helicopters and several armoured personnel carriers from the Canadian military to surround the site. On 11 September, a truck driven by two Ts’Peten Defenders near the perimeter of the camp hit an explosive planted by the RCMP. The two activists fled on foot, but a firefight between RCMP and the activists ensued, lasting 45 minutes and involving thousands of rounds of ammunition. One non-Indigenous supporter was shot in the arm, but no serious injuries were sustained by the Ts’Peten Defenders or police. The only fatality was a dog owned by a Defender. By this time, many of the original campers had agreed to leave. On 18 September, the remaining Ts’Peten Defenders surrendered to police, after advice from an Indigenous spiritual	advisor. In the end, the standoff cost an estimated $5.5 million and involved at least 400 RCMP officers. Following the standoff, police charged 14 First Nations people and four non-Indigenous supporters with a total of 60 offences, including two counts of attempted murder. A complex trial got underway in the summer of 1996 in Surrey, British Columbia, and lasted a year. Evidence presented at trial sparked accusations the RCMP had engaged in a campaign of deliberate media disinformation, barring journalists from the site to speak with the activists and “smearing” the First Nations leaders. Among the leaders of the armed standoff were William (Wolverine) Jones Ignace, a member of the Secwepemc Nation and a land rights activist. He was involved in the firefight on 11 September and was sentenced to eight years in prison after being found guilty of several mischief, firearms and assault charges. He was released on parole after five years and died in 2016. Also earning jail time for his role in the standoff was activist James Pitawanakwat, a young Anishinaabe man who was in the vehicle that hit RCMP explosives on 11 September. Pitawanakwat was sentenced to three years in prison for his role in the standoff. In 1998, Pitawanakwat was granted day parole after serving a year of his sentence and fled to the United States. The Canadian government sought Pitawanakwat’s extradition but an Oregon court rejected the request, granting Pitawanakwat political asylum in the United States, where he still lives. Though not the first Indigenous protest or blockade, the standoff served as a cautionary example in British Columbia, particularly related to Indigenous opposition to oil and gas pipeline projects. In 2016, some remaining members of the Ts’Peten Defenders, including Ignace, asked the federal government to call an inquiry into police tactics used at Gustafsen Lake. So far, the federal government has not responded to this request. Nick Shrubsole and P. Whitney Lackenbauer, “The Gustafsen Lake Standoff,” in Yale Deron Belanger and P. Whitney Lackenbauer, eds., Blockades Or Breakthroughs? : Aboriginal Peoples Confront the Canadian State (2014). Globe and Mail Read Robert Matas’s article, “Grappling with the complicated legacy of Gustafsen Lake,” (17 September 2010). CBC News William Jones Ignace, a.k.a Wolverine, dies at 82 (23 March 2016). CBC News Gustafsen Lake standoff: protesters renew calls for an inquiry (18 January 2016).